Throughout most of human history, the world's population has grown gradually. 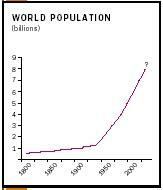 It took thousands of years for the global population to reach one billion people (around 1800). Then, in a little more than a century, the population jumped to two billion (by 1960), and to three billion by 1980. In just twenty years—between 1980 and 2000—the world's human population doubled from three billion to six billion people. The human population explosion during the past century was the result of several factors. Fertility rates remained high, while medical and agricultural advances such as antibiotics, immunizations, clean water, and improved food availability reduced mortality rates—especially among infants and children. It is difficult to predict how rapidly the human population will continue to increase, due to the many factors that affect population growth. Another important question that scholars ask is "How many people can the earth support?" While the human population grows, the earth's size and resources remain the same. Technology can increase the amount of food that can be produced on a piece of land, but it cannot increase the amount of land and water on the planet. Many people regard population growth as the single most serious global issue, because population size is closely linked to environmental and human health conditions. Environmental problems are aggravated by population explosions. More people means more resources and energy are consumed and more pollution is created and more waste is sent to landfills. More land is needed to grow crops and build houses. More trees are cut down for new homes. More cars are built, more fossil fuels are used, and more gases are released into the environment. More natural wilderness areas or beautiful landscapes are destroyed to provide resources and cropland. In short, population growth makes other environmental problems harder to solve. his famous 1798 Essay on the Principle of Population, Malthus argued that human populations tend to grow exponentially, while food production is limited by land available for agriculture. In short, human populations tend to increase faster than food supply, leading to an imbalance. Malthus projected that population increases in England would quickly outstrip the available food supplies, leading to famine and misery. Malthus's predictions for England never occurred in his lifetime. England's population did increase, but advances in science and technology enhanced food production. Malthus's theory also failed to take into account colonial growth as a result of other factors. Still, scholars use Malthus's concepts of geometric population growth today, though new models of population change are far more complex. Researchers who study population change consider many factors for each country. Population change for any group of people is determined by fertility, mortality, and migration rates. What is the average number of children per family? What is the life expectancy? Are people migrating into or out of a country? Each of these is, in turn, affected by other factors. It is important to remember that population projections are just estimates based on past information; they do not account for unknowns such as future wars, epidemics, or the effects of climate change. However, the scholars who make the projections attempt to improve their accuracy by revising projections as new information is collected. The United Nations Population Division is one of the organizations responsible for making population projections. After considering the potential impact of the current AIDS epidemic, the United Nations recently lowered its population projection for 2050 by more than one billion people. At the beginning of the twenty-first century, the world population is still growing at a rate of 1.2 percent annually. This is the same as adding 77 million people (roughly the population of France) to the world each year. A world population projection published by the United Nations in 2002 estimates that the world's human population will reach 8.9 billion by 2050. This population increase is not expected to occur evenly across the globe. The populations of some nations are shrinking while those of other nations are swelling. During the past few decades, reproduction rates have decreased in countries where the standard of living has improved; these improved living standards are generally associated with higher education levels across a population and access to birth control. Today, as many as thirty-three countries are witnessing population declines due to lower birthrates. Japan, Bulgaria, Italy, Bulgaria, Estonia, and the Russian Federation are among the countries that have achieved negative population growth. Population explosions tend to occur in regions already struggling with hunger. Africa is expected to undergo the most rapid growth, increasing from 784 million people in 2000 to nearly 1.8 billion in 2050. Eight countries—India, Pakistan, Nigeria, the United States, China, Bangladesh, Ethiopia, and the Democratic Republic of Congo—are expected to account for half of the world's population increase during the next fifty years. India may overtake China as the most populous country, rising from just over one billion to more than 1.5 billion between 2000 and 2050. Birthrates are not the only reason for the anticipated rises. The United States has a low birthrate, but a high immigration rate. Is there a limit to the number of people the world can support? Some people contend that new technologies will make it possible for the earth to support ever-larger human populations. They describe the earth's resources as virtually inexhaustible, due to the potential of technology. They point to the scientific advances that helped increase crop yields across India and China as an example of the human ability to adapt through technology. Other scholars believe that there are limits to how much technology can accomplish. They argue that the earth's capacity to support human population growth is finite—because natural resources can be damaged or depleted. For example, India's increased crop production has not keep pace with its growing population. India's per-person food production is actually dropping as the food supply is shared among more and more people. Water shortages may be the most insurmountable obstacles for human survival, as populations continue to grow. On every continent (including North America), rising demands for water are already causing water tables to drop to dangerously low levels, depleting future water supplies. Several of the world's major rivers are being drained dry before running their courses. Most of this water is used for irrigation (to grow food); less is used for industry and domestic use. Water scarcity is already a serious survival problem for people living in the more populous and arid regions of the world. Scholars predict that most of the world will face water scarcity as human demands on the earth's resources continue to rise. Despite hope for technologies such as desalinization to solve the world's water shortages, the prospects to solve global problems are unlikely. So far, desalinization is too expensive for most nations. A second challenge the world faces is food production. There is hope that breakthroughs in plant genetics and other sciences will continue to improve food production. Yet many scholars argue that even the most remarkable advances in agricultural technology, aquaculture, and ranching could not raise food production enough to meet the world's growing needs. Food production is also limited by the availability of fresh water and land that can be farmed—two finite resources. Malnutrition is already a growing problem in many regions that depend on grains. Likewise, countries that depend on fish as a primary protein source are also faced with shrinking food supplies as the world's fish populations are further depleted. Population growth affects almost every element of human health and the environment by exacerbating preexisting problems. For example, if a nation is already struggling to provide food, education, and healthcare to its people, the needs of an even larger population may exhaust the nation's ability to provide for anyone. As a result, the rate of poverty, homelessness, and disease are likely to rise. In most cases, rapid population growth results in a decline in human living standards. The impact of human population on the environment is complex. A popular theory is that the degree of human impact on the environment is determined by three factors: population size, how much each person consumes, and how much waste each person produces. India may have a much larger population than the United States, but people in United States tend to consume and waste far more goods than people in any other part of the world. According to this theory, a rise in the U.S. population would have a greater impact on the environment than would a similar increase in India's population. There are many views on what to do about global population growth. Several advocacy groups, such as Negative Population Growth, Zero Population Growth, Planned Parenthood, and the Carrying Capacity Network, focus on raising public awareness about birth control and the need to lower fertility rates. At least one group (Negative Population Growth) advocates that the U.S. government should provide incentives for smaller families and should limit immigration in the United States. The world's most populous country, China, has been exploring a variety of laws and incentives to limit urban families to one child per family, with the goal of reversing the country's unsustainable population growth. 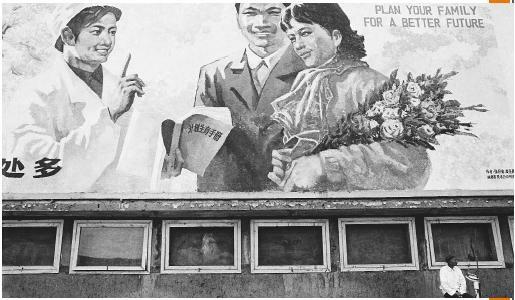 However, due to the government's inability to restrict family size in rural areas, where the overwhelming majority of China's population lives, and other factors, China's population growth is not expected to turn around until at least 2020. Slowing population growth is also a priority for many environmental organizations, including the National Audubon Society, the Sierra Club, the Wilderness Society, the National Wildlife Federation, and the Environmental Defense Fund. Most of these groups have policy statements and/or education programs that deal with population issues. SEE ALSO E ARTH S UMMIT ; E HRLICH, P AUL ; H ISTORY ; L IFESTYLE ; M ALTHUS, T HOMAS ; P OPULAR C ULTURE ; P OVERTY ; Z ERO P OPULATION G ROWTH . Brown, Lester R.; Gardner, Gary; and Halweil, Brian. (1999). Beyond Malthus: Nineteen Dimensions of the Population Challenge. New York: Norton. Cohen, Joel E. (1995). How Many People Can the Earth Support? New York: Norton. United Nations Population Division. World Population Prospects: The 2002 Revision Population Database. Available from http://esa.un.org/unpp/sources.html . "Population, when unchecked, increases in a geometrical ratio. Subsistence increases only in an arithmetical ratio. A slight acquaintance with numbers will show the immensity of the first power in comparison of the second."